The graph above is scary for a November Venice visitor. 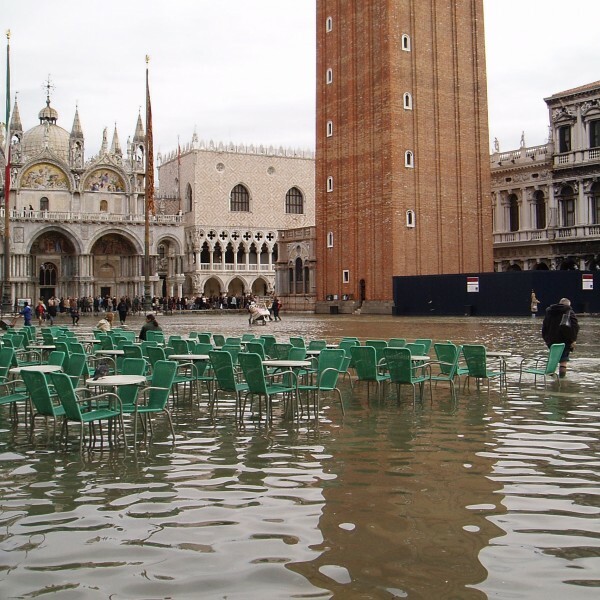 Since 1872, one third of all Acqua Alta events (defined as tides 110 cm above sea level, effectively flooding 14% of the city, and most visibly, St. Mark’s Square) have occurred in the month of November. Over time, due to subsidence and human modifications to the natural environment, the frequency of events has increased. 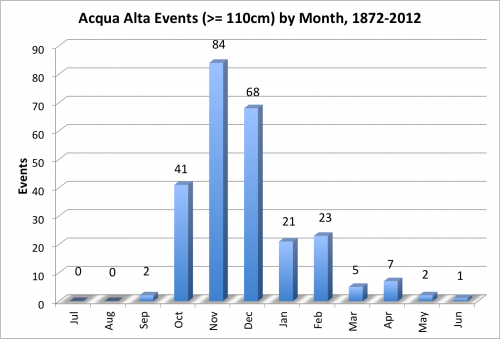 In recent history (since 1966), Acqua Alta events occur about 4 times each year. What the graph and pictures don’t show you, however, is that Acqua Alta events are actually fairly short in duration. 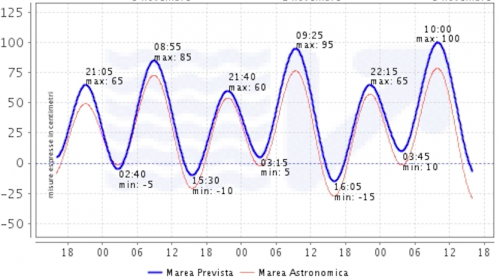 A similar graph to the one above on the City of Venice website shows that Acqua Alta events occur predominately in the morning, between 8am and noon. The actual time where flooding occurs is driven by the tide cycles. 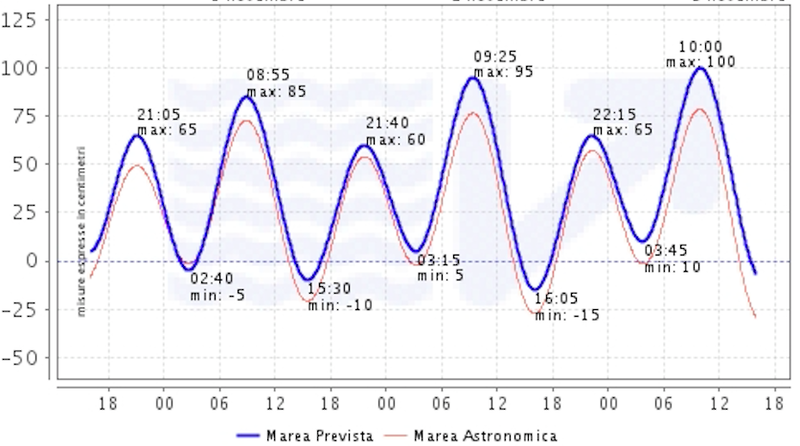 As seen in the graph below, showing the tide cycles over 3 days, the peaks span at most 4 hours. So, at worst, an aqua alta event will impact a morning. 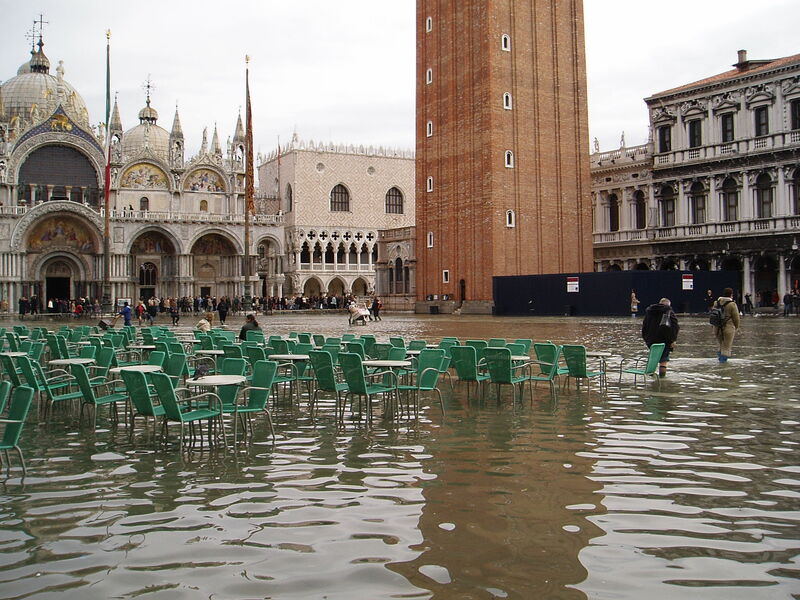 It’s also important to remember that the Acqua Alta events are driven by astronomical reasons, not meteorological. Just because the water is high, doesn’t mean it’s raining. The final thing we uncovered in our research that made us comfortable visiting Venice in November is the amount of resources the city invests in preparing for Acqua Alta. In addition to a dedicated monitoring and warning department, the city also erects elevated platforms along main streets to allow people to walk above the water. The vaporetto water buses continue to operate and many hotels we looked at provide water boots for guests. We felt very comfortable with the results. We can mitigate cold temperatures with warmer clothing, and a 2% chance of heavy precipitation doesn’t seem unreasonable compared to what we’d expect at any place anytime of the year. After addressing the weather risk, we became extremely excited to visit in the off-season. Visitors are often turned-off by the extreme crowds in Venice. We last visited in early September, and although very crowded, we still enjoyed ourselves and found seclusion in the city late at night. However, in late November, we are expecting solitude even in the daylight hours. According to statistics from the Veneto Region government used to construct the graph below, November is nearly tied with December and January for the lowest nights spent by tourists in Venice per month. 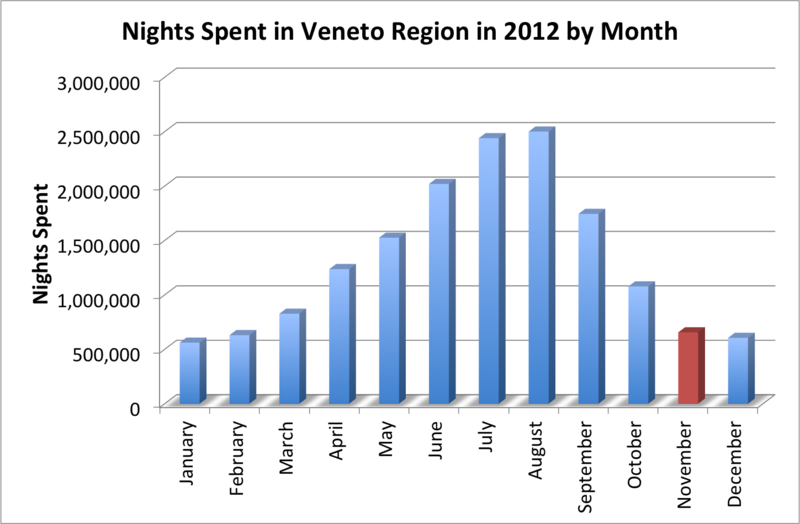 Relative to when we last visited September, there will be almost as little as a third of the people visiting Venice. Meanwhile, unlike more rural destinations or seasonal destinations, Venice will be completely open for business in November. All of the hotel and restaurant options we’ve looked at are open. We were able to use online resources to effectively address our concerns about weather in Venice in November. We are looking forward to a very romantic visit and an opportunity to see one of our favorite cities with far fewer crowds. This entry was posted in Travel and tagged Italy, Italy 2013 Trip, strategy, travel planning, Venice, weather by Ryan. Bookmark the permalink. You probably mean “astronomical”, not “astrological”. Thank you! I made the correction. I also need to write an update for this post based on our actual experience (which did include acqua alta! ).